If you answered b) One week, you are correct! You’ve won a Bozo Button! Ahem. Forgive my sarcasm, but it’s my way of dealing with the new damage my PT Cruiser suffered while parked in the lot of the Long Beach Town Center today. As told to me by Ann, she parked in a remote space nowhere near the store she intended to shop for singular purpose of avoiding having the car get dirty, scratched, breathed-on wrong, etc. She went to do her shopping and when she returned there was a note on the windshield from the person who inflicted the damaged. Let’s just say that after talking to Geico and finding out they will take care of everything, I’ve calmed down. But when Ann called me and said “Somebody hit your car,” I weaved a blanket of obscenities (not directed at her, naturally) that is still lingering in space above El Segundo. So chalk one up for people who can not only drive, but decide to park next to the car that’s all by itself, minding its own business and not bothering nobody. 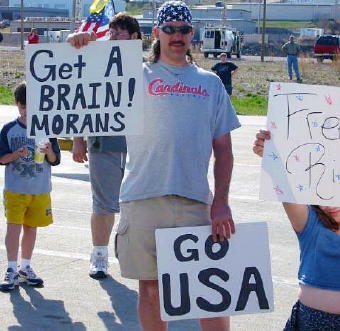 Freaking morans.